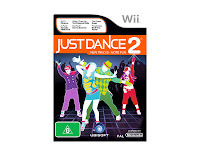 Since were were asked to review Just Dance 2 for the Nintendo Wii, it's never been off the console. But it's not me that's been playing it - oh no. First I was struck down with the dreaded lurgy and now have a bruised leg and suspected broken toe (long story). The 11-year old has been mastering all the dances (his favourites are Outkast's 'Hey Ya' and Junior Senior's 'Move Your Feet') but we have to admit that it's not really much fun playing on your own. It's a great way to work up a sweat, though. This is much more a multi-player game and it does feel as though it is the next stage up from the original Just Dance game. Gameplay is essentially the same - the moves are slightly more advanced (but still fun) and there is the option to download some extra tracks. We had a stray 400 points wafting around in the account so downloaded Katy Perry's 'Firework', which cost us 300 points.